Formative assessment is about meeting the needs of all students by collecting data on what they know and do not know. Often, teachers do assessments that get this information, record the data, and move on to the next task or lesson. The result is not formative assessment, but summative. Summative assessments record student status for meeting key objectives, and then moving on to a new focus. For every summative assessment, a teacher should consider doing 5-10 formative assessments. Teachers provide learning experiences for the purpose of helping students meet specific learning targets. Each lesson has a specific outcome that students should be able to demonstrate, whether it’s a basic skill that requires 40-60 minutes, or a complex concept that may be addressed over a series of “building block” activities across several days. Tracking students’ progress daily is critical for ensuring that they do not fall behind without being noticed. The last thing anyone wants is to spend days or weeks on a unit, and discover only with the summative assessment that students were stuck early on. This is a quick strategy that some schools use as a daily assessment tool. Given 5 minutes at the end of a lesson, students answer 1-3 questions based on the learning target. Index cards or half a sheet of paper is all that’s needed. On collecting the cards, the teacher reviews them for learning target accuracy. 1s: Cards demonstrate strong knowledge of the learning target. 2s: Cards demonstrate partial knowledge, with minor gaps. 3s: Cards demonstrate lack of understanding, with major gaps. Teacher reviews cards for trends and grouping needed to reteach or incorporate skills and/or concepts into the next lesson. Teacher creates a plan of action based on the cards. Cards may be discarded once a plan is in place. Remember, it’s a quick assessment to determine what adjustments are needed based on who and how many students did not successfully gain the expected learning outcomes. With formative assessments, looking at the data for purposes of providing support, enables teachers to think about the students’ demonstrated work in terms of what parts represent the learning target, and what kind of errors exist that are a barrier to progress. A score of 50% or 85% gives next to no information about what a student knows and does not know about a topic. This is one important reason for not grading formative assessments. Grading loses the purpose, which is to inform students and the teacher what are the learning needs. In the Exit Card example, steps 2-4 are key actions for unpacking and diagnosing the root of learning disconnects. Assessment data is often analyzed by looking collectively at the scores by all of the students. Sometimes, sampling is used to check on a few student results. These strategies can be useful, but they can miss important information at the individual level. Once students are identified by their degree of understanding or not understanding a concept (Steps 2 and 3 from Exit Card example), it’s important to take an individualized evaluation for the cause of student learning gaps. 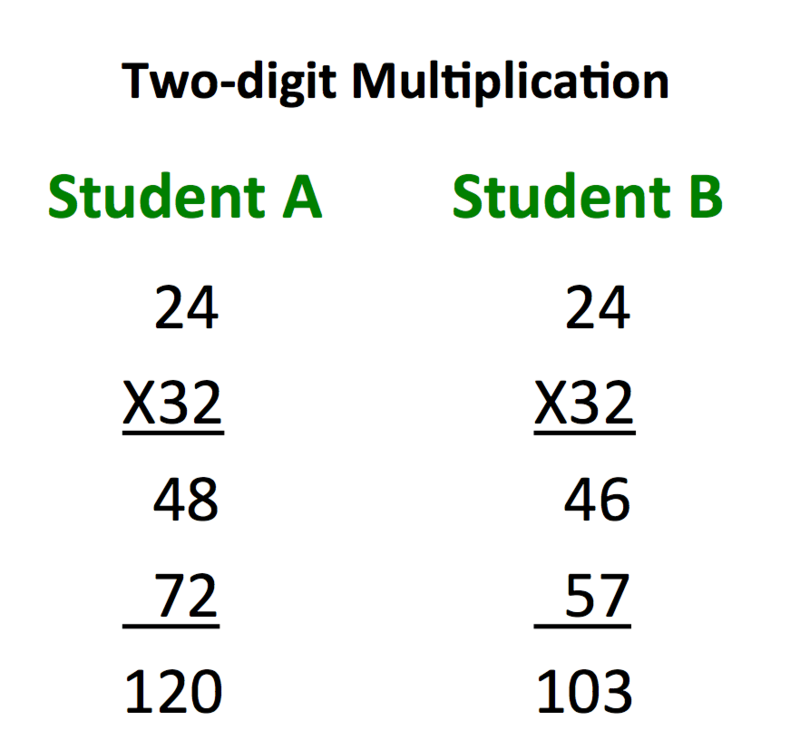 In the following math example, consider the assessment result by two different students’ work on 2-digit multiplication. One student would be rated as a 2 and the other a 3 from Step 3 of the exit card example. What clues from their work identifies the students’ needs? Both students lack understanding of aligning the second row to being with the Tens column. Student B may also struggle with multiplication. Consider how their needs might be addressed in a small group regarding alignment, and individually with Student B on multiplication. Diagnosing cause of student gaps makes reteaching and coaching targeted and time efficient. 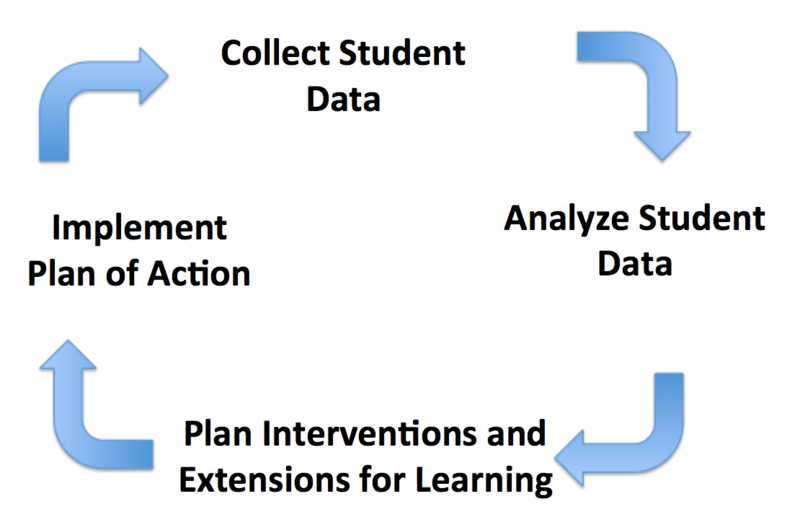 Once student(s) needs are determined, a plan of action can be developed (Step 4-5 from the Exit Card example). As we saw with the math example, the diagnosis is specific and requires differentiation. Alignment may have been a trend among several students, which could be addressed as a small group mini-lesson or a whole class review at the beginning of the next lesson. The multiplication skills issue may not be a common need or be addressed effectively as a whole class review. Let’s not forget the students who are way past 2-digit multiplication. What do we do for them to ensure they are growing? The lesson activities will need to be differentiated, and the formative assessment results help to ensure that the coached learning experiences are targeted to what groups and individuals need. This step in the Formative Assessment Cycle starts the process again. On implementing the plan via lessons and coaching, new formative assessment activities will need to occur to track if the students who were falling behind are back on track, or need more supports, framed in different ways. It’s also an opportunity to see if other students ran into stumbling blocks, or are clearly ahead of the pack, thus needing more complex work that challenges them. Some might raise the concern about time expenditures to follow a Formative Assessment Cycle when there are pressures to forge ahead with curriculum demands. Such demands and a Formative Assessment Cycle are not at odds. Using daily quick assessment strategies like exit cards or non-graded quizzes gives important feedback about the success of a lesson. What teacher or administrator exists who would prefer to be blind to whether or not students are successfully learning based on the lesson implementation? Or another way to put it, if an educator’s job is to ensure that all students are learning, then tracking success and gaps is essential. Reteaching blindly wastes time both for students and teachers. A Formative Assessment Cycle helps ensures that now child fall between the cracks, much less falling behind. Per Lorna M. Earl, it’s an obvious response to facilitate successful learning for all.